The new Citroen C4 Cactus is a bold response to the changing needs and priorities of today's car owners, accorging to the carmaker, offering a real alternative to the traditional compact hatchback, with a fresh and distinctive approach. It is priced to get the attention of Irish buyers, ranging from €17,995 for the petrol PureTech'75bhp 'Touch' spec version with manual transmission, rising to €23,845 for the diesel Blue HDi 100bhp Flair spec version. Visually, the new C4 Cactus stands out in the competitive C segment with its concept car looks, crossover styling cues, and a broad range of customisation options. The Citroen C4 Cactus heralds a new approach to automotive design, providing more styling/design, greater comfort, more useful technology as well as reduced cost of ownership. Citroen claims running costs are reduced by around 20 per cent compared to a typical C segment hatchback. And it promises impressive efficiency, with up to 3.1l/100km (or 91mpg ) ideal fuel economy and CO2 emissions from as low as 82g/km. This is partially explained by the fact that the Cactus is 200kg lighter than an equivalent Citroen C4. And remember, the weight-saving measures also reduce wear on other consumables, including tyres and brake pads. As a result Citroen has also been able to adopt smaller engines to improve efficiency, without compromising drivability. With ultra-low rolling resistance tyres, the latest-generation PureTech petrol and BlueHDi diesel engines offer a responsive drive while delivering those impressive combined fuel economy figures. The new C4 Cactus is offered with five efficient powertrains, three petrol - PureTech 75, PureTech 82 and PureTech 110 S&S - and two HDi diesels - e-HDi 92 and BlueHDi 100. Engines are mated to either five-speed manual, or five or six-speed Efficient Tronic Gearbox transmissions. The Airbump technology provides style with substance to absorb minor impacts - basically, it provides the stand-out design feature that also absorbs minor impacts which are an instantly recognisable feature of the model. Fitted to the front and rear doors, the tough air-filled thermoplastic polyurethane capsules protect against minor bumps and scrapes. Airbump® panels require no specific maintenance and reduce the stress and expense associated with car park dings and dents - cutting service and repair costs over the lifetime of the car. The intuitive and innovative technology goes much further in the C4 Cactus - it includes a fully digital Touch Drive interface, roof-mounted airbag and 'magic wash' windscreen wipers. The world's first roof-mounted passenger airbag, allowing for more in-dash storage, and it also facilitates a panoramic glazed roof with advanced heat protection. A fully digital, intuitive interface with controls grouped around a seven-inch touchscreen is impressive in this segment. The new Citroën C4 Cactus' in-car technology focuses on connectivity, efficiency and usability without adding complexity - meeting real customer needs simply and intuitively. Fitted as standard, the fully digital Touch Drive interface features a 7-inch touchscreen to control all the main vehicle functions, including; automatic air conditioning; media (DAB radio, audio streaming, mobile connections, music and photo storage ); navigation (map view, speed limit display, fuel-efficient routing ); driving aids (reversing camera, park assist, speed limiter/cruise control ); as well as telephone (hands-free via Bluetooth®, contacts, call management ); and vehicle settings. All these controls are grouped on a single screen for practicality. For greater ease of use, there are convenient shortcut keys on either side of the main screen. For a more relaxed drive, a range of innovative aids is also available, including: Park assist - for automatic assistance when manoeuvring into a tight parallel parking space, a reversing camera, which displays the rear view and guide lines on the touchscreen; hill start assist to keep the car stationary when the brake pedal is released; static cornering lights to provide an additional beam of light to the inside of bends, improving visibility and safety at corners and junctions; programmable speed limiter/ cruise control with up to six personalised speed settings; and Citroen's eTouch - the brand's localised emergency and assistance call system. Like me, you may be asking what is the typical buyer profile for a C4 Cactus? Citroen says the new Cactus sits at a market sector crossroads, offering a stylish alternative to a conventional C segment hatchback; more space than a B segment crossover; and a downsizing opportunity from larger C segment crossovers. 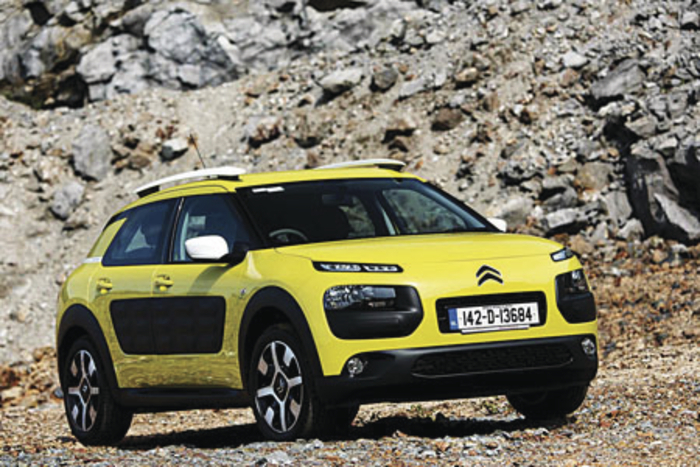 Combining the best of crossover and hatchback, the C4 Cactus pioneers the concept of the 'Crosshatch'. According to Citroen, typical C segment hatchback buyers look for attractive styling, reliability, functionality and value-for-money. A variety of needs must be satisfied, rather than one dominating factor. In contrast, B and C segment crossover customers place greater emphasis on distinctive styling, a sense of fun, personality and innovation. The new Citroen C4 Cactus' refreshingly modern exterior incorporates elements of crossover styling - such as a semi-raised ride height, wheel arch protection, short overhangs and roof bars - within a compact and eye-catching design. Externally, the new C4 Cactus features pure, smooth surfaces with flowing lines. An ideal profile in terms of styling - with 1/3 glazed areas and 2/3 body panels - stand-out features include the floating roof, floating rear quarter-panels and airbump technology. At the front, the car features a high-tech light signature with LED daytime running lights and headlights seamlessly integrated into the bumper. Offering exterior personalisation, the C4 Cactus is available in 10 body colours, from eye-catching 'Hello Yellow' to elegant 'Pearl White'. All versions are fitted with black Airbump® as standard with three additional colours available. The standard specification black door mirrors and rear quarter-panel inserts can be changed to a choice of red or white. The roof bars can also be personalised, with an optional gloss white finish or standard gloss black. A range of stylish wheels comes in 15 to 17-inch diameters, including four alloy designs. Inside, there are five choices of seat upholstery - including velour, cloth and leather options - complemented by three interior ambiences (door trims and dashboard ). The interior is de-cluttered and minimalist, with clean lines and design nods to the theme of travel. The door handles are inspired by leather luggage straps and the lid of the Top-Box dashboard storage compartment has its own luggage-inspired design. The large panoramic sunroof features a state-of-the-art coating, equivalent to category-4 sunglasses, to filter UV light and reflect heat. Eliminating the need for an additional sunblind, the design maintains headroom, fills the cabin with diffused light and saves weight (6kg ) compared to an equivalent car with a powered sunshade. The doors feature large storage bins - big enough for two 1.5-litre bottles - as well as smaller storage trays. The boot is a generous 358-litre capacity, expandable to 1,170-litres with the rear seats folded.